Be it Large/ Mid or Small cap,We help you pick the best. Get everything in one placeat the click of a button. Anyone interested in knowing what ViVeKam’s Top picks at any given moment can make use of this service. Since our analysis is purely based on scientific data, you can be assured to pick up the right stocks at any given point. ViVeKam will provide the top 10 stocks picked based on ViVeKam’s ranking at that point of time. 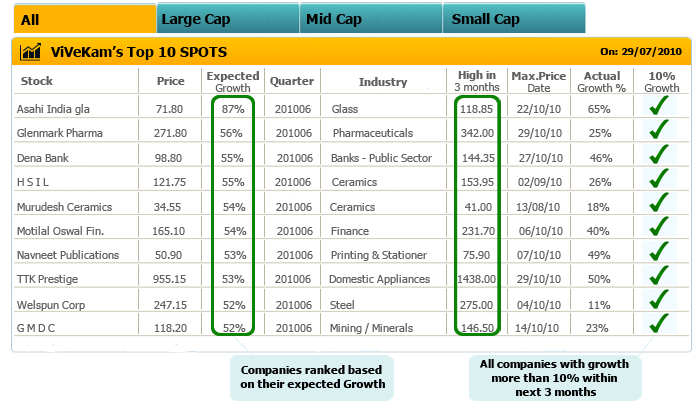 Based on the performance, underpriced stock with maximum scope to grow is determined and ranked accordingly. The ranks can also be built with a built in safeguard of not allowing more than 20% of the corpus in any single industry/Stock by using the feature top 10 from different industries. In this report we also provide the data analysis which tells u the number of stocks that went up by at least 10% in the next 3 months after ViVeKam picked them up. You will need to register by becoming a member. Please click on register now on the home page to get the various membership options and services offered.